Some time ago, we began exploring the possibilities that virtual worlds could offer the software development process. 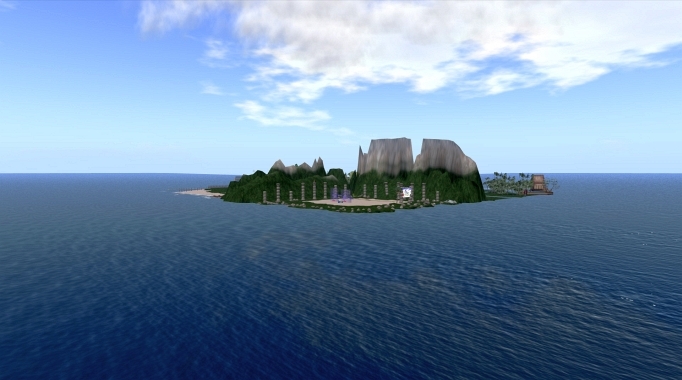 The most popular 3D virtual environment at that time was called Second Life. This virtual world seemed to be easily accessible to everyone plus it was designed for both business and social interaction rather than game play which made it appeal to the more “serious” user. During our initial investigations it quickly became apparent that there were number of interesting aspects to Second Life that could be exploited. The most obvious was that the scripts used to normally animate the virtual world could also be used to visually simulate an Executable Model (xUML) in operation. Also, such a virtual world allowed both the xUML model and the system it controlled to be shown to the user in the same virtual space. In other words, because the model existed in the virtual world it could interact with but remain separate from any physically represented "system" it was controlling. For example, an avatar "pressing" a start button on a Microwave Oven could be seen by the user as an event that flowed from the button to some receiving state machine in the model as a stream of light particles. Within the xUML model, such an event typically causes a number of state machines to change state within a chain of signals, ending in some change to the state of the Oven. So pressing a start button causes the light to come on, the turntable to revolve, a timer to start counting down and power switched to the magnetron. It is this aspect of presenting 3D scenarios during system development, testing and acceptance that is possibly the greatest benefit provided by virtual worlds. Other uses of 3D virtual environments yet to be systematically explored are for education and promotion of the xUML method. Unfortunately, the model is no longer available to see in Second Life. However, before being demolished by the Vogons in order to make way for a hyperspace bypass, a video was made and put up on YouTube. The YouTube video can be seen below or on YouTube here and the original video which is of better quality (960 x 574, 87 MB) can be downloaded from here.